Blackheads appear on the skin as annoying black spots that never seem to go away on their own. Once you spot them, you become aware of their presence and are probably tempted to squeeze them out. It turns out that — as one learns in beauty school or aesthetician school — squeezing is not really a good idea. Blackheads, also known as comedones, are a type of pimple forming on the surface of the skin due to clogged hair follicles. They usually form on the face, but can also appear on other parts of your body, such as the back, chest, neck, arms and shoulders. Medically speaking they are considered mild acne. They form when sebum, an oily secretion of sebaceous glands inside of the hair follicle, overproduces and clogs the pores. Normally, sebum has a positive role in keeping your skin hydrated and soft. However, when it is overproduced, it has nowhere to go. It clogs up pores where dead skin cells collect and produces a bump called comedo. If the skin over it stays closed, then it is called a whitehead. However, most commonly, the skin will open and the buildup will become more solid and will later oxidize. As a result, blackheads form. Medically speaking, blackheads on their own aren’t cause for any concern. In fact, most of the time, they clear out themselves. They are also not as visible as other skin problems, such as acne, for example. However, they often take a long time to clear and usually you will be tempted to pick and pinch them yourself in order to get rid of them. 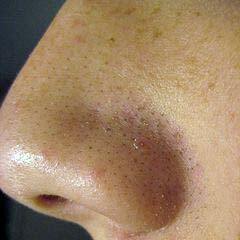 You might squeeze and prod without being able to get the blackheads out, as they are much tougher than you might think. This will only cause skin irritations and may lead to permanently stretched pores, leaving visible scars on your skin. On top of sebum and dead skin cells, blackheads also contain bacteria. If you squeeze them out, the bacteria get spread around the surrounding skin. Hence, causing more blackheads, acne, or more serious infections to occur. Sometimes, you might even end up with permanent dark spots, as the result of post-inflammatory hyperpigmentation. Instead of squeezing your skin which causes irreversible damage to it, try other safer ways to get rid of the nasty blackheads. Blackheads work slowly to reach the surface of your skin and sometimes, all they need is time and some gentle cleaning with a medical soap to get rid of the bacteria and excess skin oil. After a while, they will most likely clear out on their own. Having a proper cleansing regimen can help you get your skin in a better state faster, and it prevents blackheads from appearing. Cleansing is especially important before applying makeup as any beauty educator will tell you. Start by washing your face twice a day with a mild facial cleanser, massaging it into your skin. Then, rinse it out with lukewarm water. Dry your face with a soft towel and remove any excess oil with a mild toner and pad. Next, moisturize with a water-based product that will keep your skin hydrated. Lastly, exfoliate up to three times a month and treat your face with a mask once a week. Pore strips have an adhesive surface, come in different sizes and are able to remove several blackheads at a time without damaging your skin. However, some people can be sensitive to the adhesive, so be cautious at first. Bioré has some good strips as do several other companies. They are available for purchase on Amazon where you can read reviews as well. A blackhead extractor is a small loop attached to a small metal rod. With this blackhead removal tool, there is less chance of tissue damage to occur. This is because it gently retracts the skin around the blackhead and brings its content to the surface. See examples here: you can use an electric, cordless blackhead extractor or opt for a more traditional set of implements that don’t require any electricity (amazon links). The best blackhead extractor available on the market (your local box store has them or Amazon.com has a good selection) today depends on your experience and needs. The first type has a small spoon-like head with a hole in the middle on one end and a lancet on the other. The loop fits snuggly on the blackhead and applying a gentle pressure is usually enough to release the excess sebum out. On the other hand, the lancet is sharp and can be used to puncture the skin covering a whitehead. So, as it can be dangerous, we would advise against using this type of tool by yourself. Another option includes loops on both sides of the tool with variations. Some models have different size heads, while some are even slightly angled to help you get to the blackheads in hard-to-reach places. This is the type commonly used by dermatologists. As we have said earlier, using this instrument is not hard, but it takes some preparation and a little practice. You will get the best results if you use a blackhead extractor after a hot shower, when your skin is warm and soft. Sterilize the area and the instrument with alcohol, place the loop on the blackhead and apply a gentle pressure. Repeat these steps as many times as you need, sterilizing the instrument in between extractions. If you’re the type of person who needs to see how something is done, this YouTube video can help. Use mild soap to clean your face once or twice a day to get rid of the dead skin cells since bacteria and excess oil accumulated in your pores. However, don’t wash your face too often, as it can cause the skin to dry out and become irritated. Using skin care products with less oil will hydrate your skin without clogging your pores. 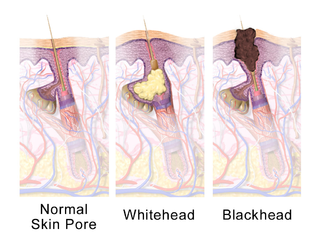 Most people will experience blackheads on their skin at least once in their lifetime. They are caused by overproduction of oil, due to hormonal changes, or consumption of some drugs or foods that mess with the chemical balance of your body. As always, prevention is key, but when blackheads form on your skin the best thing to do is leave it alone. If you don’t want to wait, try to get it out with specially designed tools like a blackhead extractor and avoid squeezing them out, as you might do irreversible damage to your skin.